The holidays are a time when many of us celebrate family, friendship, and give thanks for the blessings in our lives. However, there are so many others that are lacking during the holidays. People from all walks of life that may be lacking in finances, companionship or even good health during a time when others are celebrating. This holiday season, I am so proud to write that one of our own team members took the initiative to help impact local individuals in a positive way. Many of you are familiar with Kathryn Carman, one of our veterinary technicians. Not only is she accomplished in the practice of veterinary medicine, but she has authored blog posts that have received national recognition as well as being invited to present case studies at national veterinary conferences. 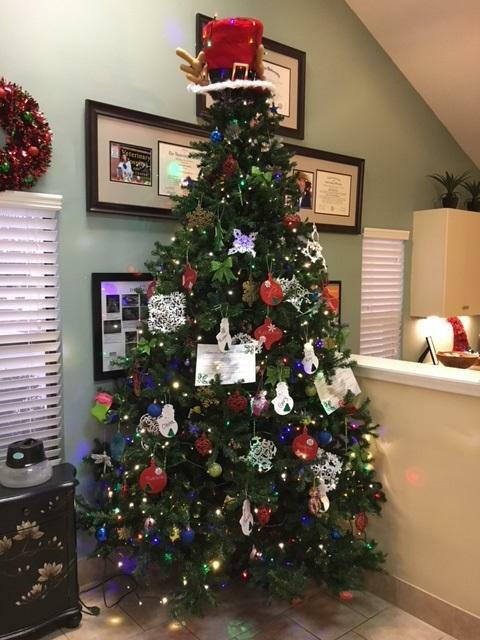 This holiday season, Kathryn decided to make a difference and started her own Angel Tree at Dogwood, benefitting senior citizens residing at the Newnan Health and Rehab center on East Broad. 20 names were placed on her Angel Tree in our lobby. Each name was connected with a wish list each individual prepared. I am so happy to say that those names flew off that tree, and in no time, all 20 names were taken. This means that 20 people in our community are going to have a little brighter holiday. Many of our team members took names and generously filled the wish lists. However, nearly half of the names were selected by our clients as well, and for this, we are so grateful. The project was such a success, Kathryn is planning on getting even more names for next year! In summary, I want to say as our holiday season get into full swing, thank you! Thank you, Kathryn, for your initiative and caring. Thank you all of the Dogwood team members that contributed. And thank you, our loyal clients, for your generosity and your support both now and throughout 2017. We are so humbled by your trust in caring for your furry family members and look forward to an exciting 2018! Happy Holidays, and Happy New Year!